Video games are not a revolution in art history, but an evolution. Whether the medium is paper or canvas – or a computer screen – the artist's challenge is to make something without depth seem like a window into a living, breathing world. Video game art is no different. 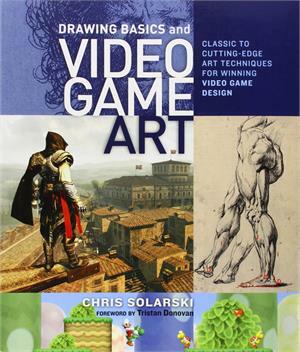 Drawing Basics and Video Game Art: Classic to Cutting-Edge Art Techniques for Winning Video Game Design is first to examine the connections between classical art and video games, enabling developers to create more expressive and varied emotional experiences in games. Artist game designer Chris Solarski gives you a comprehensive introduction to basic and advanced drawing and design skills – light, value, colour, anatomy, concept development – as well as detailed instruction for using these methods to design complex characters, worlds, and gameplay experiences. Artwork by the likes of Michelangelo, Titian, and Rubens are studied alongside AAA games like BioShock, Journey, the Mario series, and Portal 2, to demonstrate perpetual theories of depth, composition, movement, artistic anatomy, and expression. Although Drawing Basics and Video Game Art is primarily a practical reference for artists and designers working in the video games industry, it's equally accessible for those interested to learn about gaming's future, and potential as an artistic medium. "This book supports my own 30-year crusade to demonstrate that games are an art form that undeniably rivals traditional arts. It gives detailed explanations of game art techniques and their importance, while also highlighting their dependence on artistic aspects of game design and programming." — John Romero, co-founder of id Software and CEO of Loot Drop, Inc.
Chris Solarski specializes in the relationships between video game aesthetics and user experience – particularly the physical movements of players. He received a BA in computer animation and began working as a 3D character and environment artist for Sony Computer Entertainment in London. Eventually, he enrolled in art classes at the Warsaw Academy of Fine Arts. During that time, he discovered the exciting connection between classical art techniques and video game design. He currently develops his own video games under Solarski Studio. He also lectures at SAE Institute in Zurich.